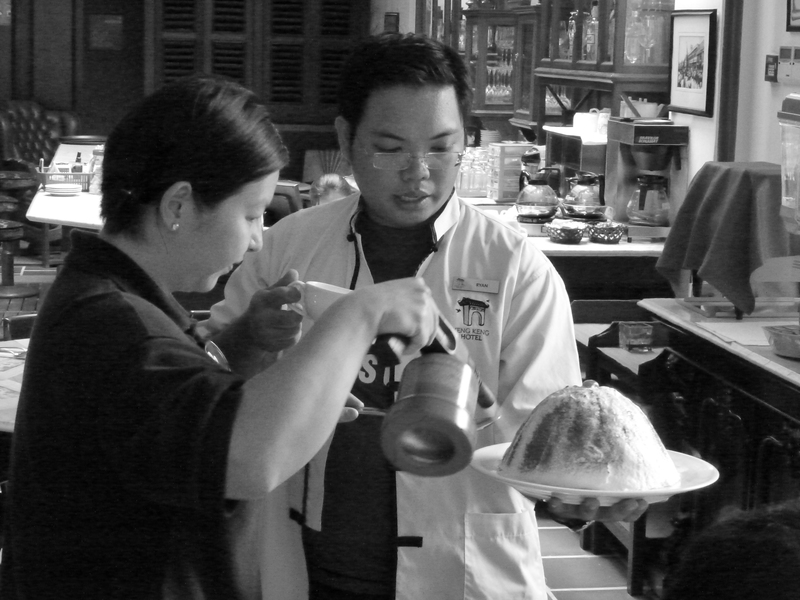 Considered the mother of all desserts, ‘Bombe Alaska’, an ice-cream cake covered with an igloo of meringue emerging from an oven found its way into the hearts of Penangites through Hainan Cookboys. Hainanese were seamen from China but locally, they became favored cooks of our colonial masters because of their skill in conjuring up many western recipes with a peculiar twist and taste of its own, the result of having to imagine the descriptions of their bosses who speaks in a language they could hardly understand. When the British ceded control of then Malaya, many of these Hainan Cook Boys as they were called became chefs of their own restaurants serving delectable delicacies they use to serve their masters with like Choon Pneah, Asam Heh, Roti Babi, Barsteaks and Macaroni Pie to name but a few but as all popular recipes would, their own style of Bombe Alaska became one of the first that faded into oblivion until a revival of interest came right after Georgetown was accorded a UNESCO Heritage status. Today, some restaurants are competing for customers serving their own concoction of Bombe Alaska as a recipe proud of its origin. The fact is, it is a real show stopper to see it being served flambed and every time it emerges from the kitchen, it never fail to garner curious onlookers. Little did anyone know that this recipe was first whipped up to commemorate the United States purchase of Alaska in 1867. Picture taken at Yeng Keng Hotel, Chulia Street, Penang.